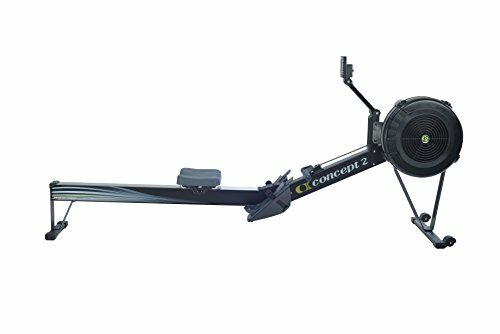 Summary: The user comments of the Concept 2 Model D Rowing Machine have more 5-star ratings than any other rower – or any other exercise machine for that matter. This is a premium product, with engineering and electronics up there with the best commercial models. It folds up between uses, and is compatible with software (Polar or their own Concept 2 trackers). If you can afford the upper-end price tag, this is a wonderful piece of kit. Check the picture gallery and impressive (and enthusiastic) user feedback on the amazon.co.uk product page now! Indoor rowing is an effective full-body, low-impact workout. Flywheel design minimizes noise while maximizing a smooth feel.^Includes the Performance Monitor 5, giving you accurate, comparable data for every row. Adjustable monitor arm.^35.5cm seat height, nickel-plated chain, adjustable footrests and ergonomic handle^Easily separates into two pieces for storage. Caster wheels make it mobile.^Requires footprint of 274 cm x 122 cm; 227kg capacity; 5-year frame warranty. The engineering behind the Model E is the same used by Olympic athletes. This is designed for rigorous training day after day, and can handle the most demanding home users at a breeze. This is reflected in a full 5-year warranty which comes with this model. It is a bigger rowing machine, with a footprint of 274cm by 122cm. It can handle users up to 227kgs (that’s 35 stone!). The frame pivots in the middle, so it stands upright when not in use. There are small wheels to help you move it into place – though keep in mind that this product is heavy. A lot of thought has gone into the extras with this model. The foot rests are adjustable to suit your foot size, and the handle is ergonomically designed (rather than a straight pole). The flywheel features a spiral dampner, which lets you easily change the resistance level. Where the Concept Model D really stands out is with the ‘performance monitor’. This is way more detailed than a standard console, giving you 5 different data-set views, USB compatibility (to transfer data to the Concept software) and compatibility with Polar trackers. You can set up your own programs, and also play ‘games’ (preset rowing programs where you hit milestones as you row). The amount of 5-star feedback as a proportion of the total is amazing. I am basing this on the UK amazon site, though the US site has 1000+ more positive reviews too. Only one negative, who found it uncomfortable and did not elaborate on that. I always look for a theme that runs through all of the comments – and in this case that theme describes this as an ‘all round impressive machine’. The durability, console and design all come in for praise over and over. One commenter also mentioned the service and delivery from amazon (surprising, people are quick to criticize this, though rarely compliment it!). This is a top-end rower as far as the price is concerned. Judging by the delighted buyers, it is worth the extra money. There is no single stand out feature. The attention to detail, console, frame and robustness of the machine all come in for significant praise. Check out the impressive picture gallery, and see that positive user feedback for yourself now on the dedicated amazon.co.uk product page.